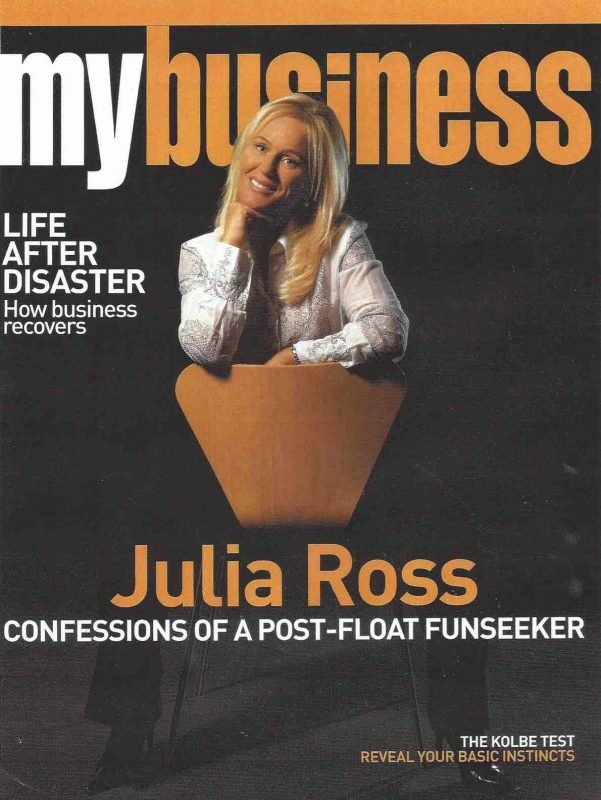 Did Julia Ross go looking for fun in all the wrong places when she listed her successful recruitment company? Recruitment Ltd (JRR), on the Australian Stock Exchange, a move designed to kick the business along and to give some of those aggressive global players more than a serious nudge on local market share, the managing director is not coy about admitting she’s ready to break out. (The move also contributed towards Ross’s personal worth estimated roughly at $50 million) [at the time of writing this article]. With a head full of ideas and fresh directions, Ross, who describes herself as a cautious risk—taker, says she’s found the past year or so frustrating. First of all the recruitment market went into decline along with a resounding round of corporate collapses. Then came the reverberations from the September 11 terrorist attacks providing, in Ross’s words, the “final nail in the coffin”. She’s talking doom and gloom for a moment when in truth her business has fared better than most. While many competitors have announced significant proﬁt downgrades and some have gone out of business, JRR has stayed in profit, effectively holding its own. With a market capitalisation of $63 million, the shares that were valued at $1 at the December 2000 float are now sliding between $1.10 and $1.31. Nice work, but you need to see it in perspective. “Up until we floated, 50 per cent growth was pretty normal for us, but this has been a very long, arduous period,” says Ross, who has an impressive list of big corporate clients and is well placed to comment on the business community at large. Ross believes she struck the worst climate for learning to run a public company, feeling under pressure to deliver results, profit and shareholder value. “Had I known this was round the cornerl might have held on for a little longer… It is debilitating because you are not able to reinvest in the business. Six-monthly reporting poses a problem because you know that people will do so much damage to your shares if you want to reinvest in a difficult time. It is certainly not the first time Ross has faced a downturn. Recession hit just one year after she started up business in 1988. She’s an old hand at tough time strategies. Her priorities are to maintain continuity of staff, nail down costs as far as possible, and to pay attention to the existing client base. This time as IT recruiting dried up she also moved the company into more viable sectors, banking and construction in particular. brand that will take them into new lucrative markets — such as IT, banking and finance — and is anticipated to make a major impact on the bottom line. Her previous attempts to broaden the offering and enter this high-yield executive market have been thwarted by the Julia Ross long-standing association with temps and office workers. After all that’s where it all began. Some years later when working in Australia as the operations manager for a large recruiter, Ross simultaneously quit her job and left her marriage, only to subsequently realise she was pregnant and in terms of finding another executive role she was unlikely to be hired in the near future. She recruited a nanny before her son, James [now 13] was born and took an apartment in the city “so I could nip home and feed him”. While the business grew in fits and starts in its early years, Ross grew a reputation for being tenacious and cheeky, a problem solver — labels that still hold today. A recent JRR client survey showed a word most associated with the business was “bold”. The early years, Ross recalls, were all about summoning “the sheer guts not to break”. The challenges she couldn’t tackle with size, she met with originality. Tapping into the immediacy of the temp worker market, Ross instigated early morning breakfasts in her CBD offices, paying teams of temps who’d await the calls of needy corporate clients, a practice which is still maintained. By the mid-90s the business was established Australia-wide and was winning national tenders. Later came an office in London, and later still the decision to float the company — not that it was made lightly. The issue of succession has been covered off with the appointment of two chief operating officers for FirstWater and JRR. “I don’t really need to be here day—to—day but I am, every day from 8am to 7pm usually, so I am still working on the business a lot of the time. On the intellectual property front, Ross has cultivated a next generation of long- term employees who understand the culture and the way she works. For the sake of her managers these days she tries to restrain her enthusiasm for being too conspicuous in the branches. Her focus is on the larger view. Driving the FirstWater brand into new markets is critical right now. Positioning the company as a real Australian alternative to the bigger (less personal) international players is another. In one bold marketing ploy, Ross had sizeable eucalypt saplings delivered to major clients recently and, to keep up the true blue flavour on another occasion, dispatched copies of Peter Carey’s True History of the Kelly Gang (2001, UQ Press). Despite the constraints of managing a public company, Ross has also been able to make the difficult decision on the technology spend, around $3.5 million, which is expected to put JRR ahead of competitors. Siebel Systems is delivering information internally on customer buying pat- terns, electronic business—to—business, job sorting, online purchasing and smaller, but significant basics such as allow- ing temps to deliver timesheets via the Net. In the day-to-day operations, Ross stands by the rules of good business practice such as never running out of cash and understanding clients. but it is in the area of her own expertise — people – that she has noticed the greatest change. “Once if you paid people well and gave them a good job then they generally did what they were supposed to do. There’s a lot more emphasis now in making sure your own people, internally, are on the bus: the right people going in the same direction. Ross herself is actively involved with children’s charities and is particularly keen on motivating women in business. She likes her staff to witness her making ethical decisions and that the company is ethical, a backhander at some global competitors’ bad habits on which she does not elaborate. So would Ross be where she is today if she had adopted that attitude? When asked about the times that gave her a major sense of achievement, front-of-mind for Ross was that her son had been proud of her when she appeared as a guest speaker at his school. On anyone’s terms Julia Ross is a success story. In 14 years she has built a business from scratch into being a force to reckon with at the big end of town. She’s rich beyond most people’s wildest dreams, but past the days of being flash with her cash, living comfortably in Sydney’s Eastern suburbs. Julia Ross has almost 30 years’ experience in the recruitment industry. This followed a career in the construction industry, where she earned her first management role for a division of the Taylor Woodrow Group. Julia quickly moved to senior level at a young age which resulted in her becoming a finalist in the prestigious Business Women of the Year Awards presented by the London Times and Veuve Clicquot (UK). Protected: Media Library Enter your password to view comments. Good Weekend – View from the top.